Yes, we know how to paint behind a toilet! Here the professional painters' secret. Wait: Is it Easy? Yes, Indeedy. There are 3 schools of thought when it comes to painting behind the toilet (or the Fountain, as the artist Marcel Duchamps called it). Then we will show you how to paint a bathroom with the best bathroom paint. Remove the lid from the tank: careful they break easily, I happen to know this very well. 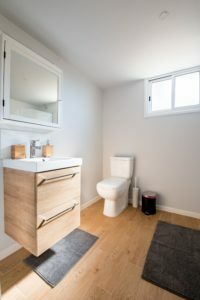 Method 1 – small paint roller: Our preferred method to paint behind the toilet is a small paint roller (click here to see), which is used in many ways: in any kind of tight spot. See in in the video just below how to use a small paint roller. You may have also seen the “Jimmy Sponge Stix” and that works very well also (see it here). This is really quick and should take you about 2 minutes per coat (you probably need 2 coats). Method 2 – paint swipe: the cheapest way to paint behind a toilet is to make a paint swipe: tape a piece of cloth to a cardboard a few inches square, and then tape that to a coat hanger. Dip the cloth lightly in the paint and have a swipe. When you paint behind the toilet with a paint swipe, don’t try to put it on as heavy as you would with a brush: put on several light coats of paint, letting each dry well. Stick the paint swipe in a plastic bag to keep it wet while you wait. 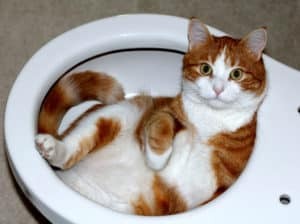 Method 3 – paint only around the toilet: If you are not that picky and don’t care, here is how to paint behind a toilet: only paint around the toilet! Just take the lid off, use your regular paint brush and swipe what you can see in normal bathroom use. Bingo. Done. Careful with that lid! Here how to paint the whole bathroom after you painted behind the toilet. First a quick checklist, then some very useful tips for painting a bathroom quickly and well. A beginning painter can do this in only about 2-3 hours of labor, not counting drying time. Fill holes, prime spots if large, and prime any new (unpainted) walls or wood. If you still have stains after cleaning, read this post about painting over a stain. Follow basic room painting procedure: we do trim, then roll walls then cut edges and we are not ashamed! Quality paints look better, hold their color longer (even in the sun), can be washed without staining, and high-quality bathroom paints are designed to resist the growth of mold and mildew. The bottom line is that you buy less and work less in the end. It’s a no-brainer. I would always recommend Benjamin Moore Aura Bath and Spa. They have done the research that shows it is more mildew and mold resistant than competitors. However, this bathroom paint costs about $70 per gallon. I always say that if you don’t have to repeat the work as often, the higher cost paint is worth it, but you have to make that decision. If that cost is too high, go with your local storekeeper’s recommendation. You do not need semi-gloss paint on your bathroom walls! This used to be the standard because the shiny surface can be cleaned easily. Yes, but these days so can eggshell finish: so use what you like and don’t listen to old-fashioned rules. And that goes for bathroom paint color too. You can use any paint of course, but bathroom walls get a little bit scummy over the years and require cleaning. These days, the better paint manufacturers paint can be scrubbed without leaving a stain. The interior designers I work with use eggshell in all rooms, including large and small bathrooms. Modern paints from the better makers of paint have gone beyond cleansing limitations of older paints. Today, the interior decorators and those who do staging for a living want eggshell in all rooms including bathrooms and kitchens. It has a slight sheen, not a shine (can be wiped), and looks great. 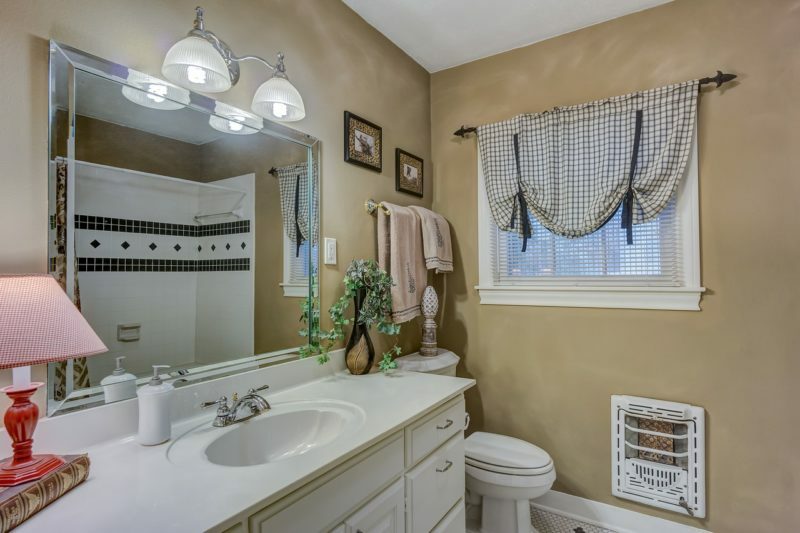 For the bathroom paint color, these days designers will guide you to warmer, lighter colors whereas in the 90’s they had to have an off-white or white bathroom. The logic is that small rooms look bigger if the walls reflect more light–and that is true. Dark bathrooms have a cramped feeling. Cramps in the bathroom: write your own punchline here. Before painting a bathroom, wash twice all walls to be painted with a light bleach solution ( a cap full of bleach to a glass of water) and then plain water. This process is toxic and you would wear a respirator (see my post on respirators here) and open the bathroom windows and use your exhaust fan if you have one. The reason we sterilize all the bathroom walls is that there is mold growing on them that you cannot see. Years of rainforest conditions grow mold, even if you cannot see it. Even scrubbing may not get it all, so seal it out of the picture with a mold killing primer: easy. 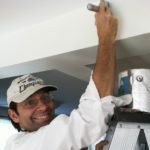 Whether you are painting a small bathroom, painting bathroom walls, or painting bathrooms ceilings, use the best bathroom wall paint that has mildew resistance as these rooms stay wet! You know another method? Let me know how you figured out how to paint behind a toilet! I have had more than one customer tell me that they want to keep the price of a painting a bathroom down and ask me to skip behind the toilet. I explained that with the small paint roller and how to paint behind the toilet. Oh, it’s the same cost? Yep. Ok, paint it. 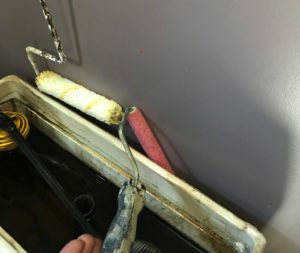 We use that small paint roller on almost every job: behind radiators, in tight areas where a 9-inch roller cannot go… and the cotton roller is easy to clean and durable. Awesome. It’s our secret weapon when it comes to how to paint behind a toilet.